Following heavy rain in Tyrol, the old B 182 Brennerstraße highway was buried by an enormous landslide in the Schönberg area. This cut off one of the most important traffic links between Innsbruck and Italy. Before hundreds of cubic meters of earth and wood could be removed, the hillside had to be secured. 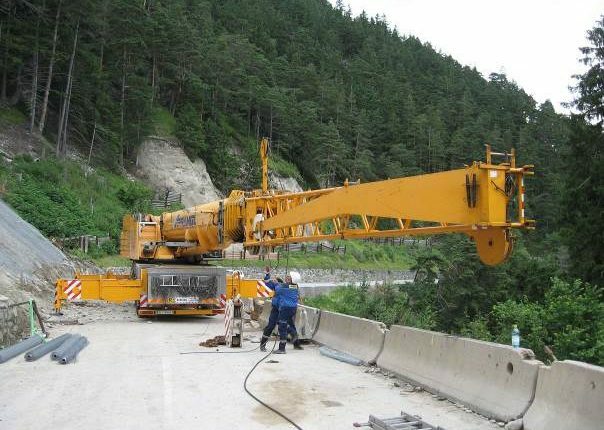 For this, Austrian crane service provider Prangl arranged a team from its Buch branch office in Tyrol to lift the necessary building materials, including the required machines, to the very top of the hillside, the crane they used: a Terex® AC 200-1 all terrain crane. “We chose the AC 200-1 for this project because its various configurations make it an extremely versatile all terrain crane. It is also ideal for work that is carried out in these lifting capacity classes,” explains Oliver Thum, who is part of Prangl’s technical field staff. Thum was responsible, among other things, for inspecting the jobsite in advance and choosing the right crane for the project. The Prangl team used the AC 200-1 crane with 42.6 t counterweight in order to lift the various materials involved. These materials included steel props and rockfall barriers that weighed up to two tonnes. “Due to the crane capacity, we did not have to use the full 68.5 tonne counterweight. We only needed two trucks to transport the base plates and the counterweight,” reports crane operator Frank Schimpf. The crane was set up right on the highway, reducing jobsite preparation. The team faced two challenges at the jobsite. The first challenge was that the road sloped down. The Prangle team had to jack up the crane’s front end in order to compensate for the sloped gradient and to ensure that the crane would be in a stable, horizontal position. “The AC 200-1’s hydropneumatic suspension system came in extremely handy at that point. It made it possible to balance the crane perfectly without any problems,” explains Oliver Thum. The second challenge was that it was too narrow to fully deploy the crane’s outriggers. The Prangl assembly team had a solution: “As this crane enables us to use different stabilizer spreads, we did not extend the outriggers fully on the side over which only the counterweight was swung,” explains Frank Schimpf. The Terex crane’s small slewing radius proved to be yet another advantage when dealing with the highway’s tight space conditions. In order to lift the building materials all the way to the top edge of the remaining hillside, the team set up the AC 200-1 crane with a 17 meter long main boom extension. With this configuration, the crane could lift the loads at a height of 50 meters and a radius of 58 meters. Once everything was set up, the lifts went smoothly for the crane operator and his machine. All the materials were placed where needed after a mere three days. After this, the team could start to secure the hillside to prevent another landslide. “During the project, both the crane’s versatility and its ease of assembly came in very handy: The combination of its versatile counterweight configurations and outrigger spreads, and the easy to install main boom extension enabled us to work efficiently and cost-effectively,” points out Oliver Thum. With a total length of 14.1 meters (46.1 ft), the Terex® AC 200-1 all terrain crane is the shortest five-axle crane in the 200-tonne (220 US t) capacity class. Its standard main boom reaches up to 67.8 meters (222.4 ft), for a maximum reach of 100 meters (328 ft) when equipped with its main boom extension and variable extension. Four outrigger settings improve jobsite access while its state-of-the-art IC-1 control system with touchscreen color monitor, makes the AC 200-1 all terrain crane particularly user-friendly to operate. A 390 kW (530 hp) carrier engine provides a powerful and cost-effective drive mechanism and is complemented with an automatic 16-speed transmission that is designed to provide high performance and excellent gradeability while reaching speeds up to 85 km/h (53 mph). Its independent superstructure engine provides an output of 170 kW (231 hp). Combining power with high maneuverability, four of the five axles (or five of the six axles if configured as an AC 200-1P crane) are steering axles, to enable the AC 200-1 all terrain crane to turn within a radius of 11.05 meters (36.25 ft). “Moving people and loads is at the core of our business” – this is the slogan under which Prangl provides its customers with a comprehensive range of services. The company’s core competencies range from renting out mobile cranes and work platforms to performing special transportation projects. Prangl’s crane fleet includes state-of-the-art machines with lifting capacities of up to 600 tonnes, which the company uses for large power plant, industrial facility, and residential construction projects, as well as for vehicle recovery assignments. The company, which was founded in 1965 in Vienna, today runs branch offices in six locations in Austria, as well as in Hungary, Slovenia, Croatia, Romania, and Germany.